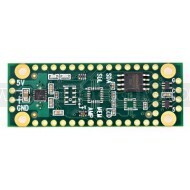 This shield features a 2 watt audio amp, high speed 5V buffers for driving APA102 LEDs, and an 8 Mbyte flash memory for images, sound clips, or data logging. It's approximately the size of a Teensy, just slightly longer to allow space for mounting holes and connections for power, speaker, and LEDs. This low-cost Prop Shield is meant for making light and sound effects on small handheld props and wearable costumes. This lower cost Prop Shield is identical to the standard Prop Shield, except the motion sensors are removed.